A computer program is a piece of software which is designed to help or better still, it is designed tell a computer what to do in order to fulfill a specific task or purpose. The Fact: Without a good computer program, a computer is a dumb -very dumb- machine. This implies that, whatever the task you want to carryout on a computer, there must be a computer program in the computer's memory that will tell it how to perform the task. Without the computer program, the computer will not do anything. A computer program is just a electronic file or write-up. And since a computer program is what tell a computer what to, it then means that the e-file/write-up needs to be written in the language a computer understand, and a computer understand's only machine language which is written in 0's and 1's. For example, in machine language (the language computer understand) the letter "a" is written as "00110101" or something similar to that. So not every body can write a computer program. But everybody/anybody can use a computer program. This implies that a computer program is made up of two front. That is, the Graphical User Interface (the front where a computer user/operator uses to tell a computer what you want to do) and the Source Program (the front that will convert that command of yours into the language the computer will understand and instruct the computer which action to take). Those who can write a computer program are called Programmers or Software Programmers. This does not mean that all of then can understand and write the language a computer can understand (machine language) no, most of them cannot. Rather what they do is to write in a more malleable programming language such as BASIC, C, or Java which humans can easily understand, and then use Compiler to turn it into a machine language which is the language a computer can understand and then save it as a file -an executable file to be precise. You snap a picture (pictures are mostly .jpg file) then you rename the picture file extension as .docx (.docx are Microsoft Word file), when you will try to open the file, you will notice that neither Picture viewer nor Microsoft Word will be able to open the file. Because Picture viewer will say, "that file extension shows it is not for me to understand" and Microsoft Word will say, "the file extension shows that it is my file, but I cannot understand the content." Same is true with how a computer program file is saved. A computer program is a file, which when stored in the memory of a computer is able to instruct the computer on what to do and what not to do. A computer cannot do anything without a program in it's memory. Thus if you have a movie stored in your computer, but there is no program (such as VLC Player, and the likes) to instruct the computer on how to show the movie, then you will not be able to watch that movie on your computer. 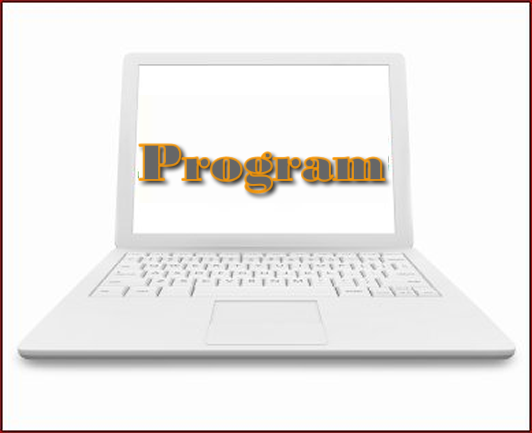 Computer programs are categorized into two, which are, System Program and Application Program. The System Program are those that are pre-installed or those program that comes along with the computer when you purchase it. For simplicity sake, we will use the Operating System (OS) of a computer as an example of a System Program. Application Program refers to program you can add and remove from a computer. Note: any program which can be remove from a computer falls under the category of an Application Program. Remember, a Computer Program is just and electronica write-up that is capable of instructing the computer on what to do and what not to do.